How many of you have been sick already this year? Contrary to what mom told you, you won’t catch a cold from going outside with wet hair or without a jacket. The real reasons we tend to feel under the weather more often in winter increased stress and lack of sleep which depress our immune systems. In cold weather, you’re more likely to be inside and in close proximity to others spreading their germs as well as traveling for the holidays on a plane with recycled air of hundreds of people– odds are at least one of them is sick. Another major factor that can decrease your immunity is a bad diet. Especially around the holidays, the tendency is to eat whatever is around, attend lots of parties, have an extra cookie or piece of pie to celebrate, or order in because it’s too cold/icy/dark to get out from under the blanket and go grocery shopping. Make it a rule that every Sunday you’ll pick out 2 or 3 recipes, do the grocery shopping and prepare those recipes that way you have grab and go options for the week when you don’t feel like cooking or running out to the store. 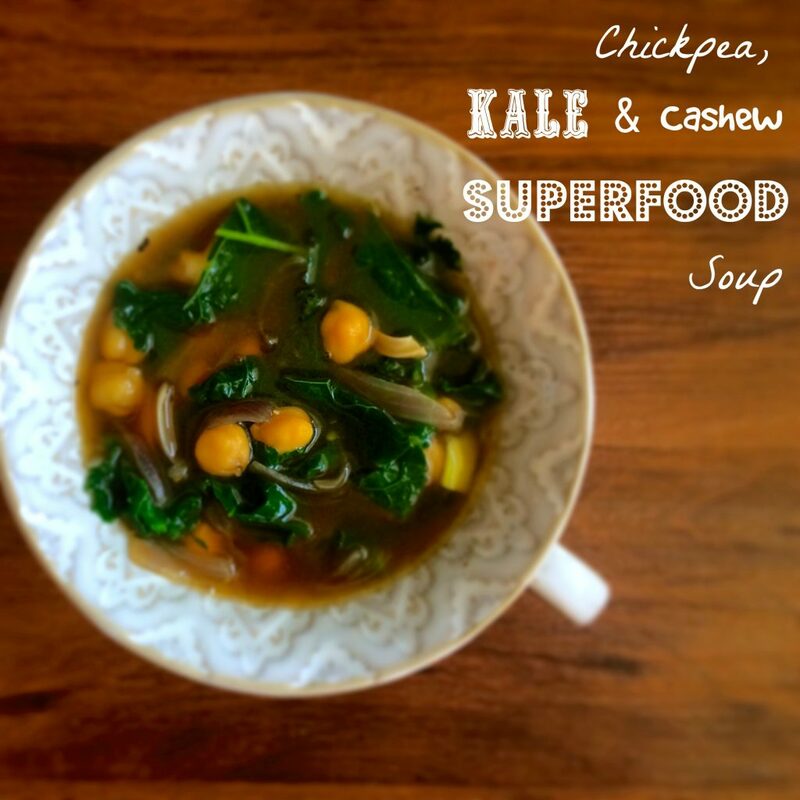 Put this Chickpea, Kale and Cashew Superfood Soup at the top of your list this week, especially if you feel a cold coming on. It’s full of fiber, low in calories (to make up for all those extra cookies), and loaded with antioxidants. Another thing you can do this winter to prevent sickness is to add a probiotic to your daily routine, especially if you’re traveling. 90% of our immune systems are housed in our gut, so it makes sense that our guts need to be healthy for us to be healthy, right? Heat olive oil over medium heat in a large stockpot. Add onion and sautee for 5 minutes, then add garlic and sautee an additional 5 minutes. Add water and bouillon or stock to pot and bring to a boil. Add chickpeas and reduce heat back to medium. Add soy sauce and simmer for a few minutes, then add kale and cashews and cook for 3 more minutes. 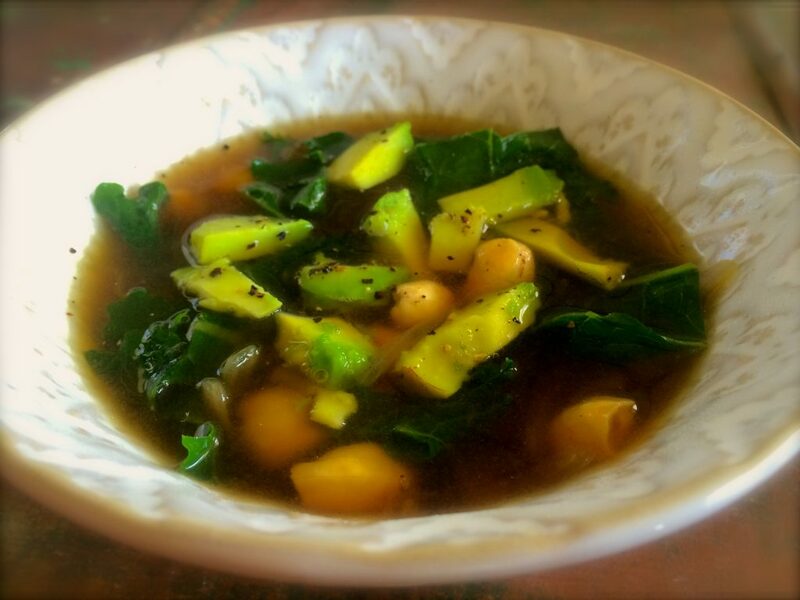 Ladle soup into bowls and top with cubed avocado.